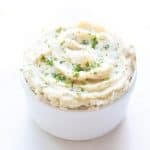 Paleo + Whole30 Creamy Mashed Potatoes – a dairy free mashed potato recipe made with cashew cream so it tastes like it’s made with sour cream! Gluten free, grain free, sugar free, soy free, clean eating. 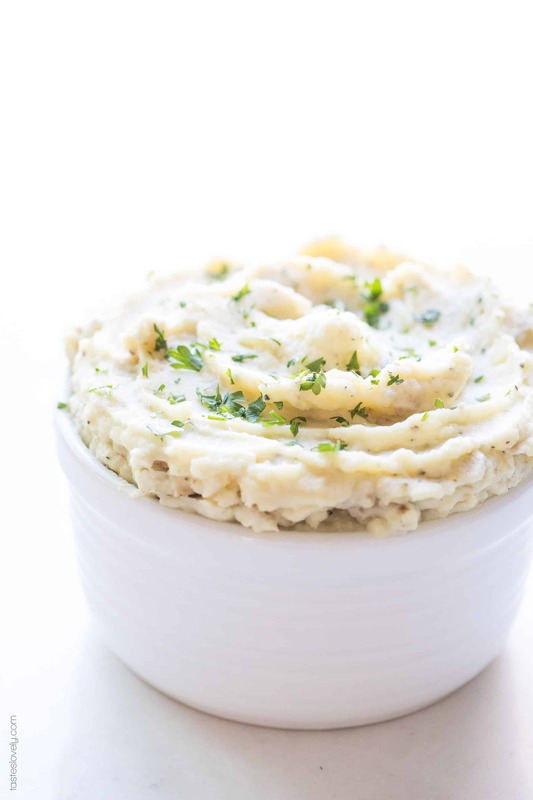 This is a new and improved update to my previous recipe for dairy free mashed potatoes. I thought I had my healthy mashed potato recipe perfected. Then I discovered all the wonderfulness of cashew cream, and I knew the first thing I wanted to put it in. 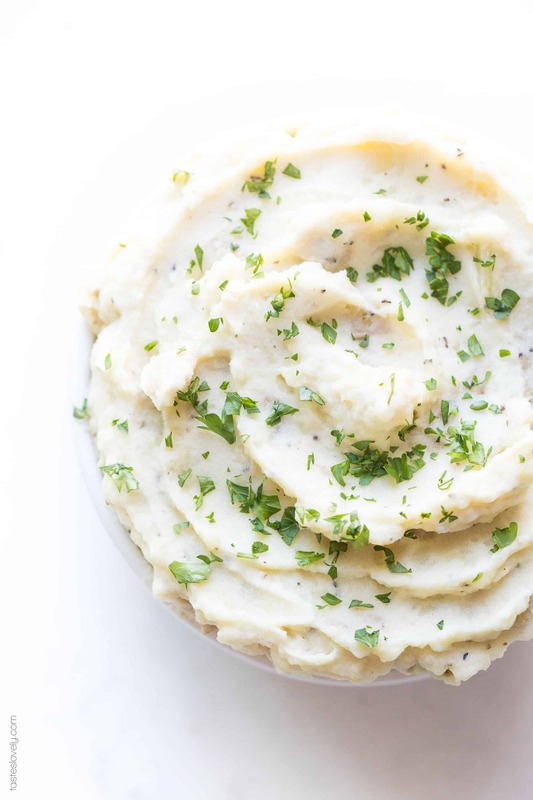 Oh me oh my did the cashew cream take these paleo + whole30 mashed potatoes to the next level. It added the creaminess that was missing, and I thought I would have to learn to live without. But now I get creamy, dreamy mashed potatoes without having to use any dairy. Along with the cashew cream, I add in a tiny bit of apple cider vinegar. Just 1 teaspoon for this whole batch of mashed potatoes. It adds a hint of acid and tang. Similar to a sour cream. And everyone knows that potatoes and sour cream are besties. Unless your body hates dairy. Then potatoes + cashew cream + apple cider vinegar are even better besties. Be sure to use yukon gold potatoes when making these. This is important. Yukon gold potatoes have less starch in them, therefore when their mashed they become velvety and smooth all on their own. To keep it simple, I leave the skin on the potatoes. No need to peel them. I find it gives the potatoes a great texture. Plus, a majority of the vitamins and minerals are in the skin. Who wants to spend their time peeling potatoes anyway, not me. You’re going to love these potatoes with my paleo +whole gravy, or with paleo + whole30 pot roast, or with my paleo + whole30 roast chicken. They’re also a definite must on your healthy Thanksgiving table! Paleo, whole30, gluten free, grain free, dairy free, soy free, sugar free, clean eating, real food. Bring a large pot filled with water to a boil over high heat. 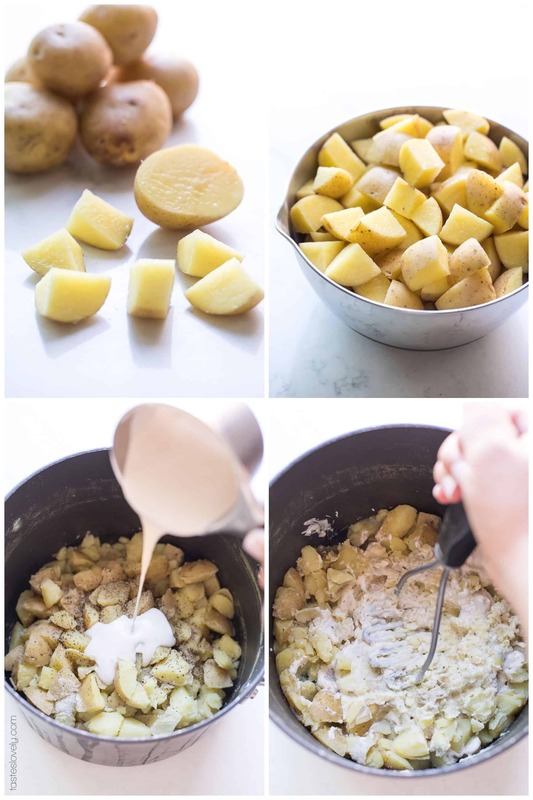 Add the chopped potatoes to the boiling water, and boil for 20-25 minutes until the potatoes are fork tender. Drain the potatoes in a colander, and return to the large pot. Turn off the heat. Add the cashew cream, chicken stock, vinegar, salt + pepper to taste, then mash with a potato masher until smooth and creamy. Serve warm. Leftovers will keep in an airtight container refrigerated for 5 days. I like to leave the skin on the potatoes. A lot of the minerals and nutrients are in the skin, and it adds great texture! But you can peel them if that’s how you prefer them. 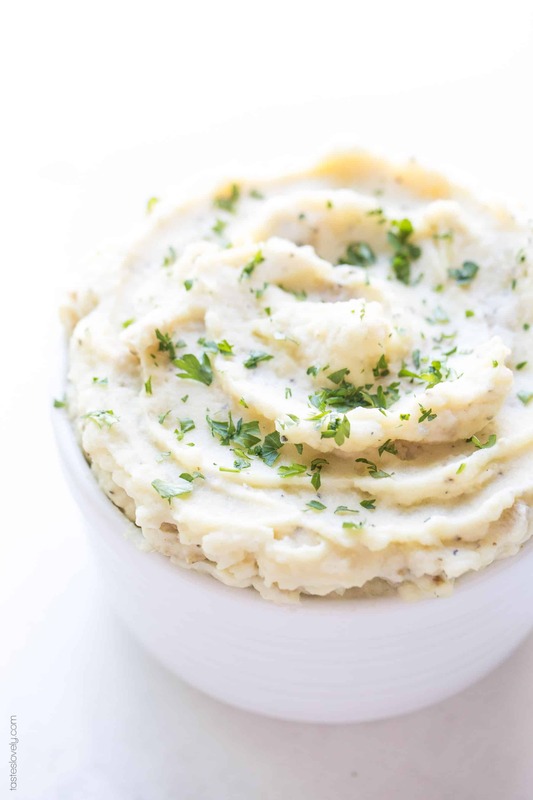 I will try to make these creamy mashed potatoes this weekend. Hope they will be yummy as yours. Thanks for sharing the recipe Natalie! Hope you love them when you make them! They’re our FAVORITE! I love mashed potatoes! I think the cashew cream is a great touch, I definitely need to give this recipe a try, thank you! Hope you love them when you try them! Thanks Bryan! 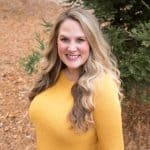 I do love mashed potatoes but this is the first time I’ve heard of paleo whole30 creamy mashed potatoes. I’m definitely going to try this out. Hope you love them when you make them! Thanks Miranda! Sounds tasty, You did an incredible job with this! easy to make and really good with tomato! My entire family loved it, I’ll definitely try to make, hope it as good as you do :)) five stars for you and thanks so much for this Natalie! Thank you so much Monica! Glad to hear your family loved it. Thanks for taking the time to let me know you liked my recipe! Can’t wait to try! What would you recommend as a substitute for the cashew cream (which I just don’t have on hand, unfortunately)? I hope you love them if you make them! Cashew cream is a pretty important ingredient in these. You can make it really easily with just cashews and water, here’s the recipe! 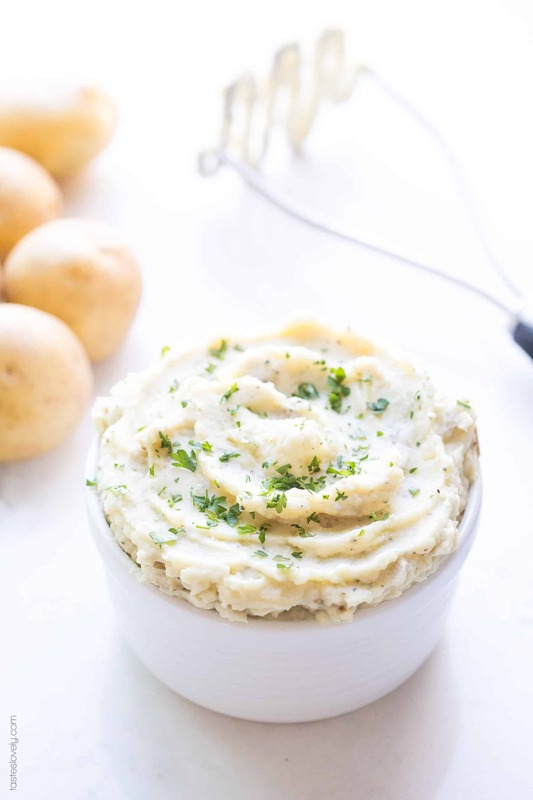 If you aren’t able to make it, here is another paleo + whole30 mashed potato recipe that doesn’t need cashew cream.